Spring is in the air, and with that comes the important task of preparing green roofs for the season ahead. While green roof maintenance plans vary according to the system, there are a few key things to know about facilitating the transition from dormant winter sedums to summer blooms. 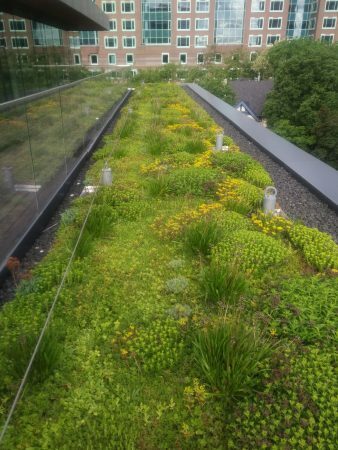 Ginkgo Sustainability’s maintenance team maintained over 200 green roof sites in the 2018 season, and will share a few trade secrets in this article. On a month by month basis we’ll break down what needs to be done to keep your green roof in the best health possible. A dormant naturalized roof in April. 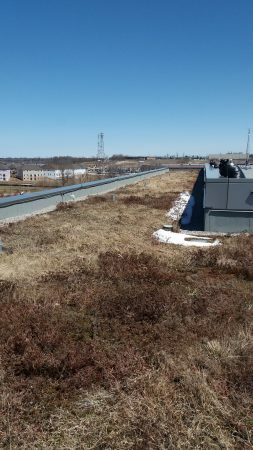 April is the month to lay the groundwork for green roof health by assessing nutrient levels in the soil. Once frost melts and the ground begins to thaw, a soil sample should be taken and sent to a green roof diagnostic lab for recommendations on soil nutrient deficiencies. This is more important on juvenile green roofs with less than three years of growth, but should be considered on established roofs if there are signs of chlorosis, stunted growth, or other deficiencies. Based on nutrient levels in the soil, a fertilizer that compliments the nutrient deficiencies of the particular green roof should be selected. It may be useful to research fertilizer suppliers or speak with a local nursery or landscaper for suggestions. On sedum roofs we typically recommend an NPK ratio (nitrogen, phosphorus, potassium) of 5-2-6, which is lower than most commercial fertilizers. This is to avoid burning plant material by over fertilizing, and is based on the logic that one can always add more fertilizer if growth is not as desired. Sedum roof showing early growth in May. In May, vegetation has broken dormancy and plants begin to increase their nutrient uptake and put forward new growth. Different maintenance providers fertilize at different times of year, but May is when we recommend that it’s done. As sedums and other intentionally planted species exit dormancy, so do weeds and volunteer species. Time spent on weeding in May will help manage weed presence throughout the rest of the season… especially if you remove the root system of the weed so that it doesn’t grow back! Other than staying on top of weeding, non living roof components should also be checked for damage from overwintering. Things to look for include blocked drains, wind uplift, erosion, and broken edging. Early signs of blooming on an allium and sedum roof in June. By June, plants should be showing signs of fertilization, with new growth, signs of budding, and perhaps early flowering. Attention to weeds will continue to be a priority through the month. Irrigation is another factor that starts to play a role on plant health in June. 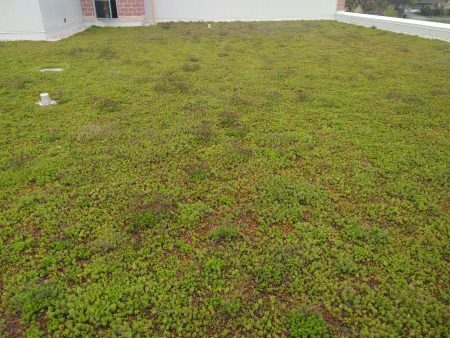 It’s important to be aware of precipitation trends and weather conditions to make sure that vegetation is getting an adequate amount of moisture, especially for juvenile green roofs (under 2-3 years old). While established sedums are drought tolerant and able to withstand hot summer temperatures, less established plants still require rainfall about once per week during summer months. If seasonal precipitation is low and no built-in irrigation is present, consider other irrigation options such as a temporary system composed of a timer, hoses and sprinklers or hand watering from a hose bib at roof level. Neglected green roofs can quickly become overgrown and fail to achieve performance benefits such as stormwater retention. Follow Ginkgo’s guidelines to Spring maintenance, and you should be set for healthy flowering and new growth into the summer months. Ginkgo Sustainability is Ontario’s leading living roof installer, existing to make buildings eco-friendly and sustainable. With offices in Toronto and Kitchener, Ginkgo’s operations span the province. We offer custom solutions and support on the design, installation and maintenance of green roof and living walls to help clients achieve their green building goals. To date we’ve installed 250 green roofs, and provide maintenance services on over 150 current sites. Our rapidly growing living walls division has been involved in over 50 projects through design, installation and maintenance services. This article was published in the Spring 2019 edition of the Living Architecture Monitor, an industry magazine whose mission is to increase awareness of the economic, social and environmental benefits of green roofs, walls and other forms of living architecture.